This weekend will mark the 100th anniversary of the sinking of RMS Titanic on her maiden voyage. Titanic never made it to Liverpool, where she was designed and registered, but Lord David Alton reveals the little-known story of the ship’s historical and ongoing links with Catholic life in the city. At 11.40pm on 14 April, one hundred years ago, RMS Titanic collided with an iceberg 375 miles south of Newfoundland as she sailed on her maiden voyage from Southampton to New York. Built in Belfast by Harland and Wolff, she was operated by White Star Line. There were around 2,200 people aboard Titanic when she sank, including some 900 crew. Notoriously, the ship had enough lifeboats for only half of the number on board and 1,517 people died; just 710 people survived. Some of the male survivors, most notably White Star Line’s chairman, J. Bruce Ismay, were accused of cowardice for leaving Titanic while women and children remained on the ship. Subsequently, Ismay faced social ostracism and obloquy. The disintegrating wreck of Titanic lies on the seabed but through a succession of books and films, memory of that fateful night remains sharp. Commemorating this most deadly of maritime disasters, Liverpool’s Maritime Museum has opened an exhibition entitled ‘Titanic and Liverpool: the Untold Story’. But within that story there is a deeper one, which links the beautiful church of St Mary of the Angels in Liverpool to Titanic, to White Star Line’s heiress, to the Poor Clares and to the remarkable Kay Kelly. White Star Line was a Liverpool company founded by John Pilkington and Henry Wilson. It made its money and reputation on trade between the UK and Australia and later on regular voyages to New York, taking thousands of émigrés from Europe to America. In 1868, over dinner at Broughton Hall in Liverpool (a Gothic house which would become a Catholic girls school), a merger deal was struck between Thomas Ismay and his partner, William Imrie and the two men went on to take ownership of White Star Line. Subsequently the company would later pass into the hands of Ismay’s son, J. Bruce Ismay. Both Thomas Ismay and William Imrie had wanted to build a small empire to bequeath to their descendants, although Imrie had no issue. However, this changed when, in 1872, Imrie adopted his niece, Amy Pollard, from British Guiana. After Thomas Ismay’s death, his hectoring and bullying son increasingly isolated Amy. An astute businesswoman in her own right, she saw the writing on the wall and removed herself from J. Bruce Ismay’s circle. At around the same time she and her maiden aunt met a Franciscan, Fr Bede Wrigley, and were received into the Catholic Church. Amy and her aunt determined to travel to Italy on ‘The Grand Tour’. They were captivated by Rome’s churches. In Assisi, at the basilica of Santa Maria degli Angeli, much venerated as the place of St Francis’ death and where St Clare embarked on her monastic life, Amy determined that she, too, would become a Poor Clare. On the death of her adopted parents in 1907 Amy was Imrie’s sole heiress and became one of the ten richest women in England, inheriting more than £18 million in today’s currency. She then took her vows of poverty as a Poor Clare, living a life of austerity and asceticism, giving away most of her money to the poor of Liverpool. In April 1944, Mother Mary Clare (as Amy became) died in poverty at the convent of Sclerder Abbey, close to the Cornish fishing village of Polperro, which her money had built. In addition, she had used her White Star Line inheritance to found the stunning church of St Mary of the Angels in Liverpool and the adjacent Friary School. The church was modelled on the Roman church of Santa Maria di Ariacoeli, with which Amy had fallen in love. She endowed it with beautiful fifteenth and sixteenth century Renaissance artefacts. These include stunning Stations of the Cross and an imposing sixteenth century High Altar which originally stood in Bologna Cathedral. Tradition has it that many saints, including St Ignatius of Loyola, St Philip Neri and St Charles Borromeo offered Mass at the High Altar. The St Anthony’s altar was brought over from Valetta, and in front of it the Knights of Malta had prayed the Rosary all night before embarking on the October 1571 Battle of Lepanto. It is a wonderful church, often called ‘The Vatican in Liverpool’, and one which deserves a Grade I listing from English Heritage to give absolute certainty to its future. Mother Mary Clare said that, ‘Liverpool people will never be able to visit Rome, so I will bring Rome to them.’ Having entered an enclosed order, she never saw the finished church herself. And it was this church which Liverpool’s Kay Kelly – who had experienced a miraculous healing from cancer – would campaign to save when, in 2001, it was closed and rumours circulated (denied by the Archdiocese) that it might be demolished. Happily, today it is used by the combined Catholic-Anglican Faith School and by the Royal Liverpool Philharmonic Orchestra. The story of the sinking of RMS Titanic on 15 April 1912 has many threads, but few are as remarkable as that of the contrasting lives of the man and woman who inherited White Star Line’s wealth, which also links two remarkable Catholic women with a beautiful church in the port of Liverpool. Commemorating these events, Brother Ken Vance SJ of St Francis Xavier’s Church in Liverpool (SFX), close to the church of St Mary and the Angels, is preparing to welcome a collection of rare and historic photos to mark the centenary of the sinking of Titanic. The photographer was an Irish Jesuit, Fr Francis Browne SJ who was himself a periodic visitor to Liverpool and to SFX. The photos are the last to be taken of the ship before she sank and so are a unique record of the events of 1912. 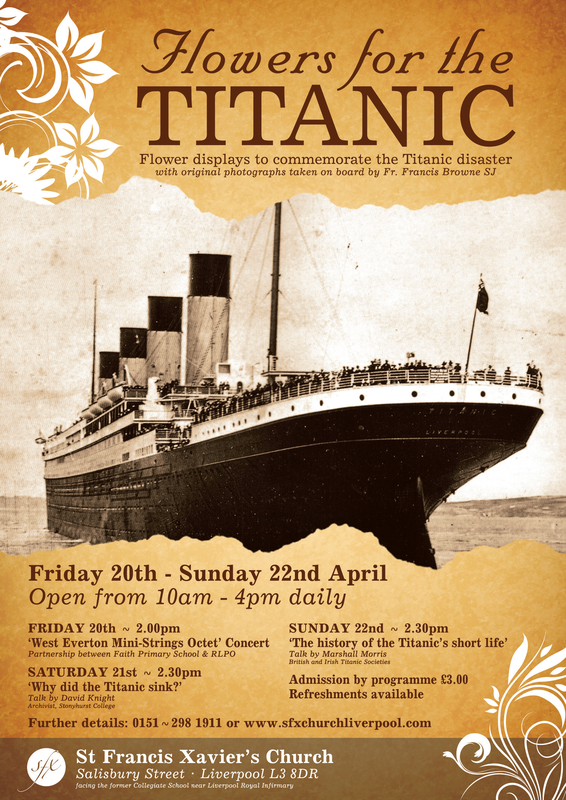 They will be a highlight of the parish’s ‘Flowers for the Titanic’ flower festival which takes place from 20-22 April 2012. Lord David Alton of Liverpool is an Independent Crossbench Life Peer of the House of Lords.